California Consulting LLC Receives Award for Work with School Districts - California Consulting, INC.
California Consulting LLC’s, Statewide Grants Manager, Tristan Shamp, and Senior Project Manager, Ann Vermal attended the California League of High School (CLHS) Region VII “Educator of the Year” Awards dinner on November 18, 2015. 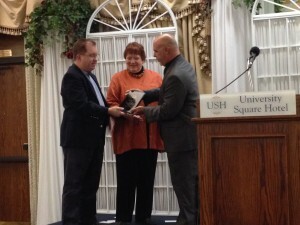 The awards ceremony was held at the University Square Hotel in Fresno. The event nominated and honored the high school teacher of the year. 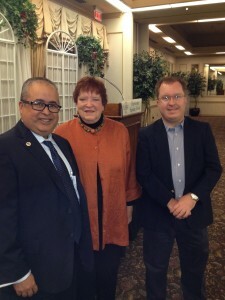 Tristan and Ann were part of a prestigious panel of judges who rated speeches given by each candidate. At the end of the ceremony, Tristan and Ann accepted an award on behalf of Steve Samuelian and California Consulting honoring our company’s support for the CLHS Region VII. The event was attended by approximately 200+ educators and school administrators from all over central California. 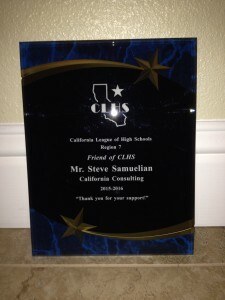 California Consulting received the CLHS Region 7 “Friend of CLHS” recognition. This recognition is reserved for individuals or entities who have provided ongoing support for the CLHS Region 7 efforts focused on recognizing outstanding educators in California’s Region 7. CLHS Region 7 extends from Bakersfield in the South to Merced in the North. Past recipients include Fresno County Superintendent of Schools Larry Powell and Jim Yovino, Educational Employees Credit Union, Tim Schneider of TGS Transportation, and Chris Hubbard of Houghton Mifflin Harcourt Publishing. California Consulting is the largest grant writing firm in California. Since 2004, California Consulting has successfully written over 670 applications. Through a combined effort, California Consulting has secured over $1.5 billion dollars in federal, state, and private foundation funding for our clients.